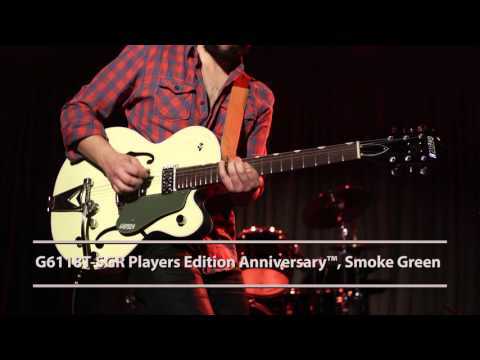 Gretsch G6118T-SGR, Players Edition Anniversary Semi-Hollow Electric Guitar, 2-Tone Smoke Green Finish, Includes Hardshell Case At the ..
At the intersection of innovation and tribute you’ll find the G6118T Players Edition Anniversary with String-Thru Bigsby. Gretsch have seamlessly blended vintage semi-hollow styling with a modern feature set - tailor made for modern guitarists that crave classic Rock & Country tone. Hollow body guitars deliver rich fullness and deep resonance. Characterizing the "big body sound," this build type is marked by huge tones that retain great clarity and acoustic nuance. A pair of High Sensitive Filter’Tron humbucking pickups responds to every note dynamically - snarling or purring according to how hard you strike the strings. The control complement - separate bridge and neck volume controls, three-way pickup switching, No-Load master tone and also a master volume - allows for near-infinite tonal variations. The all-new Gretsch “Squeezebox” paper-in-oil caps add smooth vintage tone while the treble bleed circuit lets your guitar retain all of its tasty clarity when rolling the volume control down. The standard “U”-shaped maple neck bears a 12”-radius rosewood fingerboard with 21 durable medium jumbo frets for a memorable playing experience that works with any fret-hand style. A pinned “rocking” bar bridge reacts in concert with the Bigsby B6CP vibrato tailpiece for stable tuning while the teflon-impregnated GraphTech Tusq XL nut lets the strings slide freely, without binding in the slots. A thinner, 2.25” body provides maximum comfort during long sets while the innovative Gretsch “ML” bracing allows the guitar to retain that rich, full hollow body sound. In a uniquely Gretsch touch, the Bigsby tailpiece is now string-through, making it quicker (and easier) to change strings as well as providing increased vibration transfer for enhanced sustain. A finely tuned modern music machine, this guitar features the appointments Gretsch fans desire - nickel “G Arrow” control knobs, white binding with black purfling, gloss urethane finish, pearloid thumbnail inlays, Charcoal Gray vintage thick plexi pickguard with Gretsch logo and Schaller locking tuning machines. Pickups: 2 x High Sensitive Filter'Tron "Toaster Top"